On a sunny Sunday afternoon the next year, I had the third accident at the same location as before. My car was once again hit from behind, only this time without a braking sound. The driver was an old woman. She said she was lost in thought and saw my car too late. The damaged part was the rear bumper, the same as before. 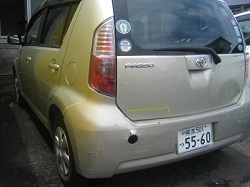 Unlike the last accident, not only the bumper but the body were damaged. My car was towed to a garage. I thought I might be killed by my car. So I decided to sell it and buy a new car. I searched for a dealer that buys such damaged cars and found one. I made a deal with him via mail and the phone. It was a good deal. The trade was very easy. The car seemed to be exported abroad after being repaired. Anyway, I never thought it would come to this. I drove that car for only 3 years. Thinking positively, it was lucky I wasn’t badly injured. However, I had to go to a clinic to heal my back for a while. I was really exhausted by various anxieties, and contacts with the insurance company and the car dealers. Then in January this year, it happened again!!! On a weekday morning, my car was pushed from behind when the traffic was slow. The driver was an old man. He said he took his eyes off the road for a moment. I wasn’t injured thanks to traffic congestion. I just had to have the bumper replaced. That was all. It was superfluous work for me. My car became the one with the history again. What’s going on my car! Drive safely, everyone. Are there laws or requirements for the elderly where you live? Where I live if an elderly person becomes at fault in an accident they are asked to get re-evaluated by the Department of Motor Vehicles. Sometimes they need new glasses and sometimes their medications cause problems with driving. It is quite common even here for elderly to get in accident and still stay driving. The next biggest problem for accidents here is people on cell phones talking or texting. Since the accidents caused by elderly people have been increasing, law was revised. New law requires that adults over 75 should take a test to check for senile dimentia every 3 years. But as for a penalty after an accident, I suppose they aren’t imposed any penalty. Just their insurance fees jump up. It’s always old men and women, right? 😦 Older drivers can be dangerous. On the other hand, have you ever made an old person angry? Maybe they are looking for you on the road and trying to bump into you on purpose!! 😛 Noooo, I’m just kidding. Gee, this is too scary! Be safe, Happy Yuan! These two posts were really interesting. Ummm, what’s going on my car??? Maybe I should be careful for the elderly. I heard some older drivers have brainsick. I sometimes see an old man complains in a loud voice at a shop. He must have a brainsick.